Have fun frolicking with the dolphins in Jamaica with our Dolphin Encounter tour that is ideal for the entire family. No matter how young or old you are, you're sure to share in the wonder that comes from connecting with these friendly and charming creatures. 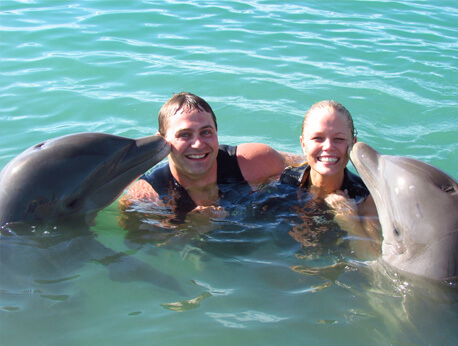 Our tour is specially designed to ensure that you get a full and well-rounded experience with our dolphins who will kiss you, hug you and shake your hand. When you're looking for a family-fun activity to do on your vacation, consider our Dolphin Encounter in Jamaica. This tour is specially designed for adults and children of all ages. Everyone in the family can enjoy the magic and wonder of getting to know the beautiful creatures that are dolphins when they engage in our dolphin program that allows you to hug, kiss and pet friendly dolphins. The Dolphin Encounter tour is not only a fun activity, but it's a safe one as well. This tour is intended to be set up to accommodate both swimmers and non-swimmers. You’ll be able to be submerged in the water with the dolphins but if you don't know how to swim or aren't keen on doing so, there's no need to worry because the Dolphin Encounter is held in Montego Bay and doesn't require any swimming effort at all on your part. Instead, you simply stand in knee-deep water and enjoy the dolphins coming to you to give you a hug, kiss, and even a handshake. You'll be delighted at the immense amount of affection these dolphins express throughout the interaction. After your tour with the dolphins, there's plenty of other fun activities that you can engage in as well. For instance, enjoy watching the Shark Show that allows you to learn all about marine and sea life, or have fun petting the camels. Shop for souvenirs that you can remember your trip by, which include interesting items such as hand-crafted items and jewelry made by local artist. As with all tours, there are a few rules, regulations and considerations that must be taken into account. While our Dolphin Encounter is kid-friendly and one of the most popular attractions for kids, we do require that children under the age of 8 be accompanied by an adult in the tour. Also, we ask that you arrive at your tour location 30 minutes prior to the commencement of the tour so that we may provide you with a briefing before venturing forward into your 12-minute interaction with the dolphins, stingrays and other marine life.